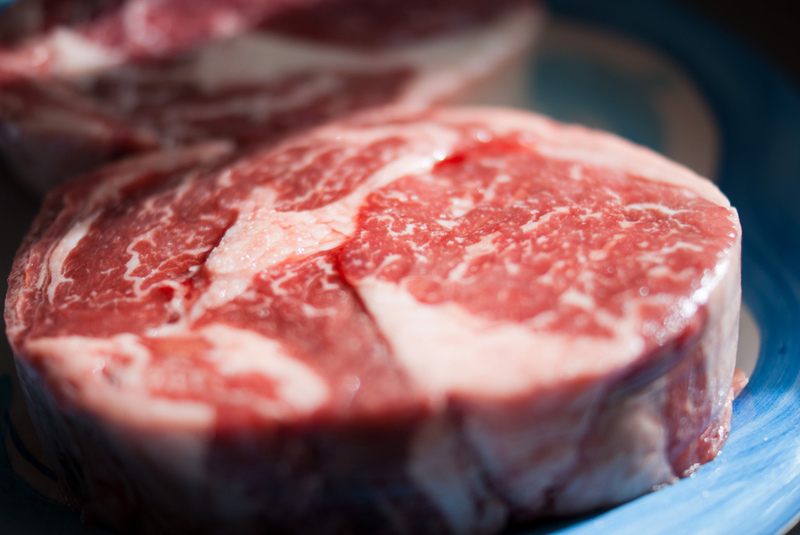 It’s the same internal struggle every Saturday afternoon at the grocery store: I sidle past the steak, eyeing those creamy veins of fat marbling the thick, weighty cuts. With some caramelized onions and sea salt, I’d have a delectable dinner. Then I catch myself, and shake my head. Beef is supposed to be bad for the environment, and I’m building a career on my passion for nature. I’ll say “no” today. It’s just one steak, and I’m just one person. The rest of my cart is environmentally responsible. And steak is delicious. A perfect porterhouse joins the organic lettuce and locally sourced squash and apples in my cart. I won’t feel guilty until I’m washing my plate. The recently published USDA 2015 Dietary Guidelines includes an entire chapter on sustainable diets. It concludes that cardiovascular and anti-cancer benefits aside, low-meat and vegetarian diets are the most eco-friendly. My first look at the research was not reassuring. One of the first numbers I saw said that livestock agriculture causes 80 percent of the 652 million tons of agricultural greenhouse gas emissions, which make up 10 percent of the nation’s total greenhouse gas contributions. As we clog our atmosphere with these gases, every extra kilogram of CO2 or methane counts. I looked at study after study, trying to find any conclusion that didn’t single out beef as one of the worst environmental offenders. One new study finds that beef requires 30 times the land and five times the greenhouse gas emissions needed to make an equivalent caloric amount of pork, poultry, eggs or dairy. “Eating beef, in my book, is an environmental transgression,” Gidon Eshel told me. Eshel, a climatologist at Bard College in New York, co-authored that study. The problem with beef, he said, is that a cow is a fundamentally inefficient animal. Cows are ruminants, meaning they eat bulk forage and ferment it in a special organ called a rumen. There, bacteria break the fodder down into energy the cow can use. Ruminants therefore have a huge evolutionary advantage, as they can get nutrition from plants that other animals can’t. This digestive innovation isn’t so great for agriculture, though. Cows need six times the amount of feed as pigs do to make a single pound of meat. All that feed — the corn, the soy, the grain — has to be grown and transported, requiring tractors and trucks, which use fossil fuels. The greenhouse gas emitted during fertilizer production further adds to the environmental cost. The U.S.’s consumption of beef is the largest in the world, and drives an $88 billion industry, according to the USDA. About $500 a year of that, plus hundreds of kilograms of CO2, come from my own thrice-a-week beef habit. “We are headed on a collision course between current patterns of food consumption and sustainability,” said Samuel Soret, who studies the environment and public health at Loma Linda University. My quest toward guilt-free steak was looking grim, until I had a revelation. Cows don’t have to be fed on corn! For tens of thousands of years they happily munched on grass. If the major issue with beef husbandry was crop production, it couldn’t do any harm to have one lone little cow grazing by the side of the road, right? While some grass-fed beef production practices just stick the animals on a plot of land that they quickly demolish, other farmers like Coleman are exploring grazing options that mimic natural migration patterns. Joe Salatin, a farmer in Virginia, has pastures that are five times as productive as his neighbors’ because he rotates his cattle between areas, letting the grass blaze into its full growth rather than being clipped off before it can regrow after the last visit from a cow. So all I had to do was buy grass-fed beef from farmers like Salatin to avoid the negative environmental impact. Triumphant, I redialed Eshel to prove that I could enjoy my steak without “transgressing” against nature. Eshel quickly quashed my hopes for a perfect, grass-fed loophole. “I’ve never found one shred of evidence persuasive enough to support the notion that grass feeding somehow offers a waiver from the environmental liability of beef,” he said. I hoped he was exaggerating, but he carefully laid out the facts for me. It’s complicated to quantify these sorts of environmental conundrums, because we end up balancing things that are difficult to compare, like the impacts of pesticide use versus water use, for example. But Eshel is trying to put a number on how bad a grass-fed cow is for the environment compared to a corn-fed cow. His preliminary research indicates that it might be up to twice as bad in terms of greenhouse gas emissions. Methane gas lasts longer and stores more heat than CO2, making it a more dangerous greenhouse gas. Grass-fed animals burp more methane than corn fed cows because of the way grass interacts with their rumen bacteria. Eshel also noted that in most cases, cows can’t graze all year-round. Salatin’s farm in Virginia is in one of the few places where the animals don’t normally need supplemental feeding. His animals graze all but 40 days of the year, during which they are fed stockpiled hay harvested from his pastures. The cows can even graze in the winter because grass retains most of its nutrients when dried. Grass may ease the feed burden, but in most places cows will need grain during some months. But perhaps most importantly, there aren’t enough places with conditions like those at Saladin’s farm to meet our societal meat demand. There isn’t enough land to support America’s beef herds, unless we were willing to push crop agriculture off of our most fertile land and turn it over to cows. Clearing forest to make room for pasture reduces habitat for wildlife, and can decrease natural CO2 storage. I could buy a carefully selected cut of grass-fed beef for myself, but it isn’t feasible to satisfy our entire consumption of meat with all grass-fed animals. And at twice the cost of corn-fed meat, it could only be an occasional luxury for me, not an easy substitution. Many people couldn’t afford it at all. I may not be able to change everyone else’s meat consumption, but I can change my own and reduce my own carbon footprint as much as possible. Soret’s studies have found that vegetarian or semi-vegetarian diets (eating meat fewer than once a week) produce a bit less than half of the associated greenhouse gas emissions as a meat-eating diet. His work has been echoed by U.K. researchers, whose study found an even greater reduction in greenhouse gases. Both of these studies looked at tens of thousands of real diets that people were eating, not modeled or theoretical plates. Both also found significant health benefits, including a longer life, associated with vegetarian and semi-vegetarian diets. These conversations with the scientists left me slumped in my chair, mentally cataloguing which of my favorite recipes I would have to modify or eliminate altogether. But when I asked if I really had to be a vegan, both Eshel and Soret let me off the hook a little. Soret entreated me to “just please come down a few levels on the food chain.” Most of the studies done on sustainability of diets emphasize that this is not an all or nothing question — any reduction can have important benefits both for personal health and the health of the planet. In the end, my love for wild spaces and desire for a well-functioning ecosystem will win out over my taste buds. I’ll be reaching for more vegetarian- and fish-based options. And when I sidle past the beef, just every once in a while, maybe a nice grass-fed slab will end up in my cart. Sometimes, guilt makes a good garnish. A previous version of this story stated that beef requires seven times the greenhouse gas emissions needed to make an equivalent caloric amount of pork, poultry, eggs or dairy. It is actually five times the amount. You have been influenced by the propaganda put out by the vegetarian-PETA types. Stop and ponder reality and you might understand that nothing is more environmentally friendly than grazing livestock. Grazing livestock replicate exactly what was occurring on our earth for millions of years before man invented farming a mere 10,000 years ago. Farming requires huge resources (water, machinery, fuel, ripping up of the soils, applications) and for many months of the year cropland lies fallow — producing global warming gasses. Always, always, always grass-fed livestock are on pastures that are carbon sinks. (Ranchers do not dump them on pastures and destroy their pastures. They aren’t stupid.) When cattle are on pastures that means the gases produced by livestock are absorbed by the grasses in a symbiotic relationship. That is a relationship that goes back to the beginning of life on the planet. On the farming side of the ledger, far and away most of our country’s cropland produces crops that are high glycemic, nutrient lite, with highly skewed fatty acid profiles that are the cause of the Omega-3 deficiency and most of the chronic diseases in our country. Keep in mind that 18% of our GNP is spent on healthcare. Most of that is for chronic disease. Therefore the current farm-based food system in America has a far higher cost than just its environmental cost. The health crisis it causes costs more than what is spent on food. So buy your grass-fed meats and eat hearty for your health and the health of the planet. Don’t fall for the idea that farming is a natural practice that is good for the planet and mankind. It just plain isn’t so. You haven’t looked through alfalfa and other legume crops. On one hand, beef will emit a bit more when they eat alfalfa. However, rotating crops with legumes decreases the overall amount of fertilizer necessary for soil on a cereal crop. Also, some crops are not suitable for human consumption. Failures during the year due to pest, disease, or weather deteriorates a crop that is more suitable for animals. Next, some land is not even suitable for crops. Rocky land,or land with a lot of hills, are of more use to grazing than growing. I commend anyone who takes the time to analyse their actions and impact on the world, but it’s a shame you ended with a relatively selfish statement indicating you’d still be buying animal meat on some occasions regardless, and eating more fish options. I hope you and others look towards all the delicious plant based options that exist, especially in America, and make the right choices consistently so that we can all work together to avoid a complete ecosystem break down and the devastating effects of climate change in the near future. The animals who have bolts driven into their brains and knives ripped across their carotid arteries so foodies can satisfy cravings can at least take comfort in knowing that other animals may be spared when it suits foodies. Lydia you should check out the film, ‘Cowspiracy, the Sustainability Secret’. It brilliantly lays out the environmental effects of animal agriculture, and lays bare the environmental movement’s denial of these effects. Firstly, you say “methane gas lasts longer and stores more heat than CO2, making it a more dangerous greenhouse gas”. The first claim is incorrect. A key benefit in dealing with methane (CH4) is that it breaks down to a large extent within 12 years, whereas CO2 is around for hundreds of years. Mitigation efforts aimed at methane provide relatively quick results. Please see my page “GWP explained”, http://terrastendo.net/gwp-explained/. Secondly, Joel Salatin’s pastures at Polyface Farm may be more productive than those of neighbouring beef properties, but their nutritional yield is poor relative to plant-based alternatives. Finally, fish-based options may seem better than beef in terms of climate change, but they are a disaster for the oceans. In any event, that may exacerbate climate change, as it may affect the oceans’ ability to absorb carbon (which can only continue for so long anyway). Oceanic ecosystems are being destroyed, representing a disaster that’s occurring out of sight. The pre-fire habit of destroying conscious life forms to provide energy for ourselves-whether it’s another caveman who has the only handful of berries or a cow is the root cause of all human conflict. The cow is a particularly good character test. There is a slow, stupid animal with lots of great tasting energy just standing there asking for it. Your choice says everything about how you view your relationship with life and energy. This comment is written by a man who grew up on a farm, didn’t believe a meal was a meal unless it contained meat for thirty seven years, stopped eating red meat a year ago, became a vegetarian six months ago and a vegan three. I have never felt better in my life and the sight/smell of dead animals at the grocery store is nearly enough to make me gag. Plus vegan food tastes infinitely better once your taste buds come back to life from the years of being deadened by the overwhelming flavor of meat. With the actual water shortages you may understand that water is stolen too. It is human destiny to stop eating animals. It is a choice that can be made right now, though it requires personal fortitude to step outside the statistical norm, which is a life of pursuing indulgence. If this choice is made by the 20% of the population who think, the 80% will follow. What will be the “think” that the 20% thunk?